Since we’ve dealt with GoDaddy a few times recently, I will let you know 1) why this is possible and 2) how they make way more money from you on the other end. 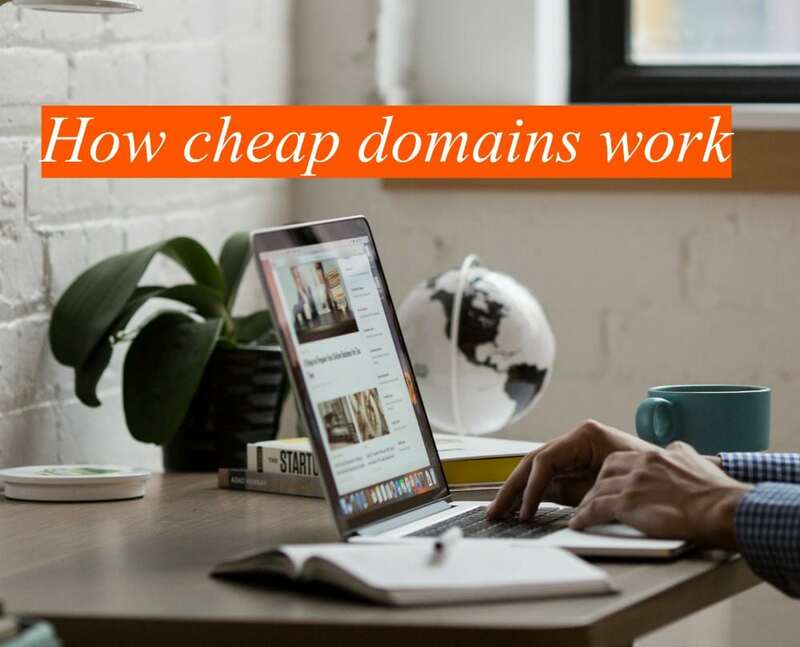 Domains under $1 are a loss leader. If you are a domain reseller (like GoDaddy or just about any other company you can buy a domain from), you can buy a domain for $8-10. Maybe if you are GoDaddy, Network Solutions, or some other large provider, maybe you can get them slightly cheaper for your bulk purchasing power. But $10 is a good general rule. Because people/companies pay to be domain resellers (around $400/year I believe), they need to charge you a bit more than $10 to make up for paying this reseller fee, the time to help you buy the domain, etc. A company I use (Enom) charges $13.95. So Enom makes $4 on me when I buy a domain from them. This helps pay their reseller fee, their website support, and all that stuff. What happens when GoDaddy charges 50 cents or 99 cents for a domain? They take a loss. I’ve even heard this acknowledged from someone who works there. In the retail world, we have loss leaders. That means a product is advertised below cost to get bodies in a store (who ideally buy more things) and GoDaddy has taken this concept into the virtual world. They make their money in the end, trust me. Me: Hi, I have this SSL I just bought elsewhere and I want to install it on my site… but clicking the SSL icon keeps taking me back to the homepage for the account. Am I just not looking in the right spot? GD Guy: No you are. You can’t install a third party SSL on a GoDaddy site, you have to buy one of our SSLs. Me: But yours cost $69 and I bought the one I need for $12 and I want to use it. GD Guy: Sorry, that’s not possible. What’s the refund policy on the one you just bought? Me: I don’t want to buy something for $69 when I can have it for $12. GD Guy: Well if you look up ‘GoDaddy coupon codes’ in your web browser, you’ll find some crazy deals. Then just buy it at least for a few years to lock it in. So there you go. Once you enter the GoDaddy ecosystem, you are kind of stuck there. And some of their solutions seem to cost more (sometimes substantially more like in this case) than other equivalent solutions I’ve seen on the open market. You can think of the free domain as your hotel offering you ‘free’ WIFI or your wedding photographer offering you a ‘free’ 8×10 print. It is a gesture of goodwill you are indirectly paying for anyway. If you want to be one of those people that buys domains from GoDaddy and immediately transfers them elsewhere, be my guest. I have friends who do it! But saving $10 means taking the time to apply for the transfer, approve it, etc. so I find just buying it at the right spot works for me. In terms of places I like to buy domains, I like enom.com and namecheap.com (note: this one is an affiliate link which means I get a portion if the money if you buy something). So whenever you see a low price tag like Godaddy charges for domains, pause and think about why it’s so much cheaper than everything else. Reading online reviews, asking colleagues, and researching the company will tell you if it’s a deal… or something else. Before we get into this blog post about the use of customizable URL shorteners, let’s clear the air about one other thing: Big Foot is real. Without a doubt. I know, because I’ve seen him in various documentaries, most notably, 1987’s gripping “Harry and the Hendersons,” http://www.imdb.com/title/tt0093148/ which recounts a failed attempt to integrate a Sasquatch into a typical suburban American family. A Big Foot even landed a sweet endorsement deal with Jack Links Beef Jerky, and yet the lamestream media all but denies the existence of this gentle, pungent creature. What does this have to do with customizable URL shorteners? If you’re like me, you probably have hundreds of online articles, videos and other Sasquatch-related media bookmarked. You cite that media when you give your annual Big Foot Power Point presentation, hard copies of which you give to attendees. The problem is, many URLs are long, cumbersome, difficult to remember and hard to retype in your web browser. For example, The Atlantic posted a great story titled “Why Bigfoot Sightings Are So Common Across Cultures.” But no one want to retype: http://www.theatlantic.com/science/archive/2016/10/sasquatch/505304/. Note that The Atlantic’s website appears to include a plug-in that integrates its name into the shortened URL, but also limits the customizable options of Bitly. I also like Tiny URL, a free service that allowed me to generate this customized link: tinyurl.com/BFcommon. Shortened links are also useful for directing print readers to sites with additional data, such as a videos or interactive slideshow that augments the print experience. Shortened URLs also means it’s easier for your audience to access public documents, such as the government’s top secret 800 page spreadsheet chronicling Big Foot sightings in Acadia National Park for 2016. Obviously, you can’t reprint the entire thing to include in your Acadia Big Foot Society newsletter. But you can post the report online and provide a short, snappy customizable link in your mailer that will make it easier for folks to access the raw data. Shortened links makes it easier for your audience — whether live or print — to access any content with a URL, and to pass that content on to others. And using a clever, succinct, shortened URL will really set you apart from those UFO nuts. Believe me, those guys are cray-cray. Next: We’ll show you the how to use shortlinks online, and give you a look at the tools offered by Bitly to help you gather analytics. Every month here at Breaking Even, we try to have a loose theme. This theme determines a series of blog posts, our monthly email newsletter subject, and gives us an opportunity to dive into a concept we think people should care about. How many of you have said one of the following things? We ALL say them (I am including myself here) because, after years in our business, we have a pretty good idea of what our customers want and don’t want. Thing is, we don’t know what anyone thinks. Ever. We can guess. But we can’t know. We can really only manage what we measure. So in order to get an accurate view of what is and isn’t happening is present the same set of customers with two almost identical options with one variable change (ex: color of a button) and see how people react. This concept is called ‘A/B Testing’ and is this month’s theme! 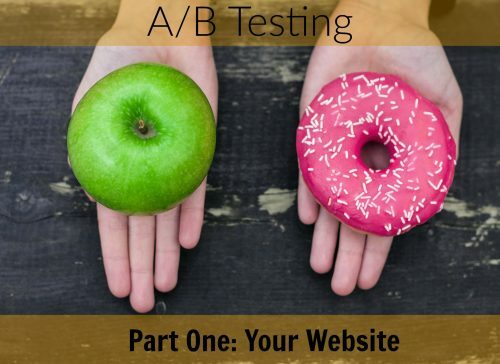 If you want to know some basics about A/B testing, I wrote a lovely blog post about it previously. Click here to read it. OK, so what can you test on your website? I wanted to make that list somewhat ridiculously long but I think you get my point. Deciding what you are going to test to start off with may be as simple as deciding what’s important to you. For example, if email signups are important, you may test an email signup positioned in header area versus sidebar and see how this change affects signups. You may want to start with testing something ‘controversial’. Maybe everyone in your company argues about whether your products should have a plain wood or a plain white background. You obviously need to test long enough to collect some data, so when and how long you run your test may depend on how much web traffic you get, among other factors. That said you probably don’t want to do this during a really important time, say, during the holiday rush. Think long enough to get data to make a decision and not so long that it annoys everyone. You don’t want to be in testing mode all the time, so plan your year accordingly. Quarterly tests may feel often enough, or twice yearly may be more than enough. Just put it on your calendar/agenda as something to do at a regular interval. This is probably your biggest question: how do you do split testing on a live site? Using your current website software (ex: Wordpress) with Google Analytics goals. There is a robust discussion and how-to here: http://www.wpbeginner.com/wp-tutorials/how-to-ab-split-testing-in-wordpress-using-google-analytics/ Note: this is somewhat limited as, for example, it would be somewhat impossible to use this method to change, say, menu text as it works best on main page content. Use a third party A/B testing service like Optimizely or VWO. Check out their complete guides to A/B Testing, here for VRO and here for Optimizely (not affiliate links). Note: Remember if someone makes something easy for you, you’ll likely have to pay them. If you’d like to learn more about A/B testing this month, subscribe to both our blog and monthly email newsletter. I was recently chatting with a friend about required reading for English Majors, namely Dickens. “I don’t think Dickens was that great,” he said. “Well…he’s not fun to read” I conceded (this from the girl who read A Tale of Two Cities for fun in 8th grade). “What if his stuff only became so popular because like 10% of the population was literate back then?” And I had to admit, I’d never really considered it before. This conversation, combined with a recent post from Seth Godin discussing the recent increase in people/businesses using video in their marketing, has made me think a lot about changes made possible by resource accessibility. Once education and literacy were available to a larger population, there was a wider variety of published material. Just look at what we have today: tabloids, magazines, novellas, newspapers. Then the internet happened, which was a great equalizer in terms of marketing. People were eventually able to publish their work online once blogging platforms like Wordpress came around. And as social media sites became popular, people didn’t have to necessarily write anything of length anymore to be heard. A sentence now can literally be seen by millions, or at least has that potential. You no longer have to be technologically savvy to put your “stuff” out there. As Seth’s article points out, you also don’t have to be a skilled photographer anymore to get Instagram accolades. You don’t need to be able to code to have a website, or get a television contract to have people watch your videos. With the help of a smartphones in particular, all of these activities are accessible to the greater public. First accessibility happened to text, then it was links and photos, now it’s video. More recently, video has become the newly accessible medium for all. According to this article written last year, people don’t expect high production value on videos shared via social media. These videos can get away with having a home-video level of production quality. Some ideas for live video (the kind that can be streamed as you record and get published as-is) include product demonstrations, “Ask Me Anything” sessions, and more. If you do want to add a bit of production, there are some relatively cheap options out there like iMovie or WeVideo. You may have to pay a little, but it’s significantly cheaper than outsourcing to a different company entirely to do your editing. Distributing video is also easier, since you don’t have to haggle over advertising space or air time on t.v. YouTube, Periscope, Facebook, and all of the other social media sites make it easy to upload videos (for free!). Again, people aren’t necessarily expecting anything cutting edge in terms of production in these places. People are consuming as quickly as you’re producing. As the world of online marketing becomes more accessible, the better it is for small businesses. Although many of these things (video, analytics, general website maintenance) require some time and training to be done well, it’s worth the investment. Accessibility means we’re all learning together and that’s pretty cool.